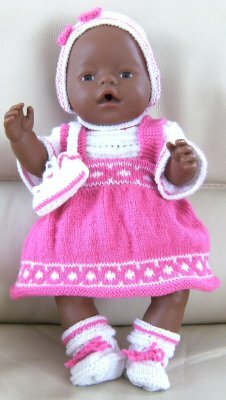 I lent this pattern to a friend of mine and she made this very lovely Pretty in Pink set for the baby born ! I like the colors and the pattern very much ! Comments for pretty in pink ! What a lovely outfit!! I love your pink with the white that you chose for your colors. Your friend did a lovely job on the outfit!!! What a perfect choice of colour for this doll. She looks charming! I think this pattern is very beutiful in pink. Nice to see it in other colours.